All of the worlds legal systems focus on the sanctity of contracts, and on damages as the remedy for breach of contract. Yet parties to international contracts often adhere to differing legal theories and fundamental notions that can lead to misunderstandings misunderstandings that can wreak havoc with large-scale construction and civil engineering projects. 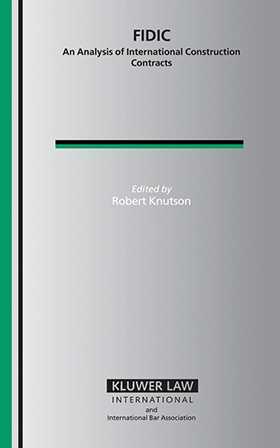 In this unique guide to the suite of contracts published by FIDIC (The International Federation of Consulting Engineers) the contract forms most widely used for international construction undertakings twenty-two outstanding authorities in construction law from a wide variety of countries describe relevant likely pitfalls (and special opportunities) for foreign lawyers in each of their jurisdictions. The countries covered are Brazil, Egypt, England, France, Germany, India, Japan, Malaysia, The Netherlands, Saudi Arabia, Sweden, and the United States. The books great usefulness, however, is not limited to these countries; as the editor points out in his introduction, legal systems are so widely shared among groups of countries that reasonable extrapolation is available here to virtually any construction site on earth. Introduction. Brazil; F. Gonzaga Bellegarde Nunes, M.I. de Almeida Alvarenga, A. Zuliani Réa, F. Simões Castejón. Egypt; B. Atallah. England; R. Knutson. France; M. Frilet. Germany; W. Rosener, G. Dorner. India; S. Mandal, V. Shivanna, P. Dodd. Japan; K. Takayanagi. Malaysia; W. Abraham, R. Singh. Netherlands; E. Eggink. Saudi Arabia; C. Hammond. Sweden; P. Samuelsson, L. Iwar. United States of America; J.J. Myers, J.K. Giffune, L.K. Miller.